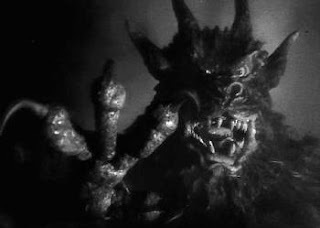 Understated and immensely provocative, Tourneur’s Night of the Demon pays homage to the films the director made with producer Val Lewton in the early 40s (Cat People, I Walked with a Zombie and The Leopard Man). Regarded as a classic of the genre, and testament to the power of suggestion and evocation, Night of the Demon is based on a short story by MR James: The Casting of the Runes. Dana Andrews (sans silver underwear) plays sceptical American psychologist Dr John Holden, who comes to England to investigate and disprove the supposedly supernatural acts of a sinister cult led by Dr Julian Karswell (Niall MacGinnis). Upon his arrival he discovers his friend and colleague Professor Harrington (Maurice Denham) has died under mysterious circumstances. Accompanied by the late professor’s niece Joanna (Peggy Cummins), Holden investigates the matter further only to become ensconced in a dark and uncertain world where the supernatural is frighteningly real. Much of the story unfolds in a setting of low-key, ordinariness. This makes the intrusion of the supernatural upon the lives of the characters much more potent. When events take a sinister turn, it is all the more effective. This is perfectly played out in a scene involving an initially innocent enough séance that turns sour. 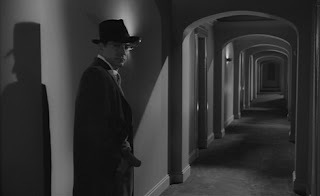 The film is a paradigm of subtlety and chilling suggestion: aside from several garish shots of the demon (which actually don’t detract from the subdued moodiness at all), included at the insistence of the producers, the film conveys its scenes of terror in quietude and impressionistic insinuations: shadows shimmering on walls, a disembodied hand appearing on a banister in the forefront of a shot, all add to the subdued mystery and moodiness. The film is laced with mesmerizingly striking images such as the moody opening montage of shots of New Grange, and the scene where Holden is making his way back through the forest to his car from Karswell’s mansion, pursued by a fiendishly glowing cloud. 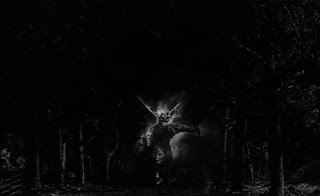 When the demon emerges from a shimmering cloud at the beginning and the end of the film, it is genuinely eerie and unspools as a kind of dark visual poetry, the like of which has rarely been glimpsed in Tourneur’s work since I Walked with a Zombie. The opening shots of a panicked Professor Harrington driving through the night, his own terrified reflection on the car window his only companion, are chilling to the core and instantly command attention. 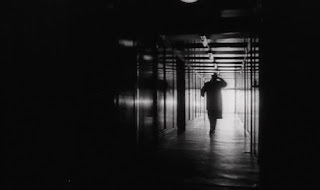 Much of the camera work enhances the foreboding atmosphere, for example when the unwitting Holden is given the cursed parchment by Karswell, and subsequently marked for death, the shot of Karswell retreating down a dimly lit corridor shimmers with an otherworldly distortion, almost as though the camera were about to swoon and pass out. It perfectly illustrates Holden’s entry point into the realm of the supernatural and reflects his soon-to-loosen grip on rationality. It is to MacGinnis’ credit that he provides a startlingly sympathetic portrayal of Karswell. Though he is a powerful Satanist, he still elicits the audience’s empathy to a large degree. The scene in which he reveals to his mother that the morbid acts he carries out are done through fear, provides vital insight into the motivations of his character. Satanic cults and demonic curses aside, Karswell is quite the jovial fellow. When Holden comes to his mansion to meet him, he discovers Karswell dressed as a clown and entertaining a group of local children. The sight of Karswell in clown garb is subtly disturbing and perfectly highlights the evil actions that his appearance belies. The shots of him bounding along the railway track after the fluttering parchment (ever just out of reach) conveys his futile desperation perfectly. Holden is another example within the genre of a rational, scientifically minded character that comes to realise that there are forces in our universe which cannot be logically explained away. He soon realises that he has been marked for death and his only hope for survival is that he accept the existence of the supernatural and not dismiss it. Dana Andrews provides quite a stiff, though assuredly convincing performance. The battle of wits that takes place between Karswell and Holden, when the latter attempts to pass the cursed parchment back to the former, onboard a train at the film’s climax, drips with tension. Night of the Demon unfolds beneath an otherworldly and dread-drenched ambience and is utterly compelling from beginning to end. 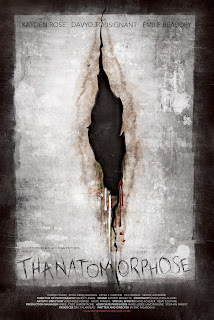 Its concept of a cursed chain letter pre-empts such films as Ringu (1998). A hidden gem within the genre. Such a great film. There's something wonderfully eerie about the sound effects and the growing sense of the demonic presence. The film is almost let down at the end with the special effects depiction of the demon, however for suspense and inventiveness, this film is hard to fault. 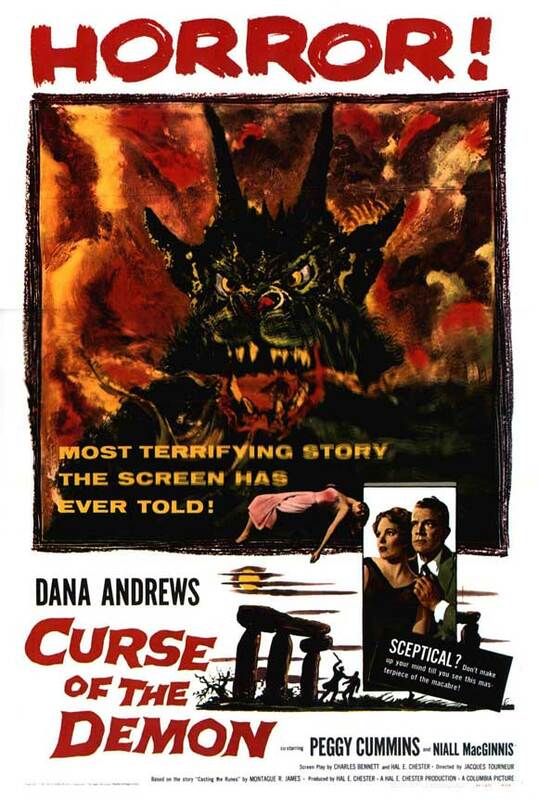 One of my favorite movies of all time The newer movie ...Sam Rami's "Drag Me to Hell" owes a debt to the basic storyline of "Curse of the Demon"
One of my all time favourites too, Doc. And you're absolutely right about Raimi's shocker owing a huge dept to the basic storyline - itself adapted from Casting the Runes by MR James. Thanks for your comment!